Do you need some gum? Have you ever been a little to close to someone who could use a breath mint? Its happened to all of us, and sadly some of us have even been the problem. It somehow seems that the days that you eat garlic for lunch is also the days when you run out of your last pice of gum. Convenient, right? Imagine this. You are sitting next to an person in class when they open their mouth to yawn, and you nearly puke because it smells like they haven't brushed their teeth in 4 months. Gross, right? I hope to fix this problem, and make Saline High School a much more enjoyable place. 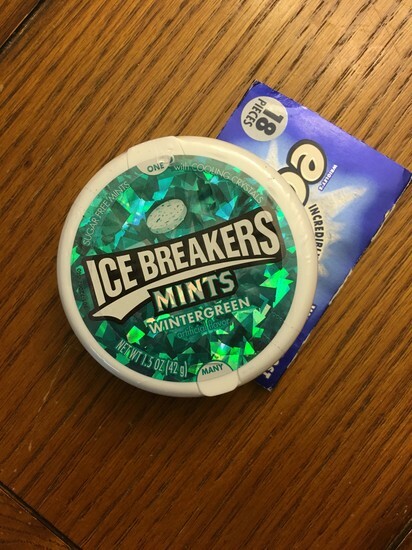 I will set up a box filled with mints and gum in the hallway where people walking by can freshen their breath, or simply get a piece of gum if they just want to chew it. I will ask people before I set up the box if they have ever been a victim of this, and I will the same people after if they noticed any improvements. This is a very significant problem, because how are you supposed to enjoy school when these kind of things happen when there is such a simple solution. I am excited to hopefully make Saline a much minty-er place, one piece of gum at a time.